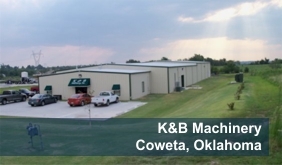 K & B Machinery is located in Coweta, Oklahoma. We cover a six state radius to include: Arkansas, Missiouri, Kansas, Texas, Louisiana, and Oklahoma. We provide high quality workmanship and the best service available. We take pride in our team slogan - "We will meet or exceed factory specifications of alignment and accuracy." We have been doing complete rebuilding and scraping since 1977. We have over 100 years of combined rebuilding experience. We have built a solid reputation with customers in the machine tool, aviation, oil field companies and more. We also provide field service from trouble shooting to extensive repairs. K & B Machinery has grown over the years due to repeat customers and word of mouth. We are happy to be in our new, modern facilities ready to continue our service.